AQUA [WATER], ADIPIC ACID/NEOPENTYL GLYCOL CROSSPOLYMER, DIMETHICONE, CYCLOPENTASILOXANE, GLYCERIN, SODIUM ACRYLATE/SODIUM ACRYLOYLDIMETHYL TAURATE COPOLYMER, ISODODECANE, VP/VA COPOLYMER, ISOHEXADECANE, POLYSILICONE-11, CAPRYLYL GLYCOL, CAPRYLIC/CAPRIC TRIGLYCERIDE, AMODIMETHICONE, HYDROXYPROPYL METHYLCELLULOSE, POLYSORBATE 80, PARFUM [FRAGRANCE], HEXYLENE GLYCOL, METHYLISOTHIAZOLINONE, TOCOPHEROL, PROPYL GALLATE, CITRIC ACID. 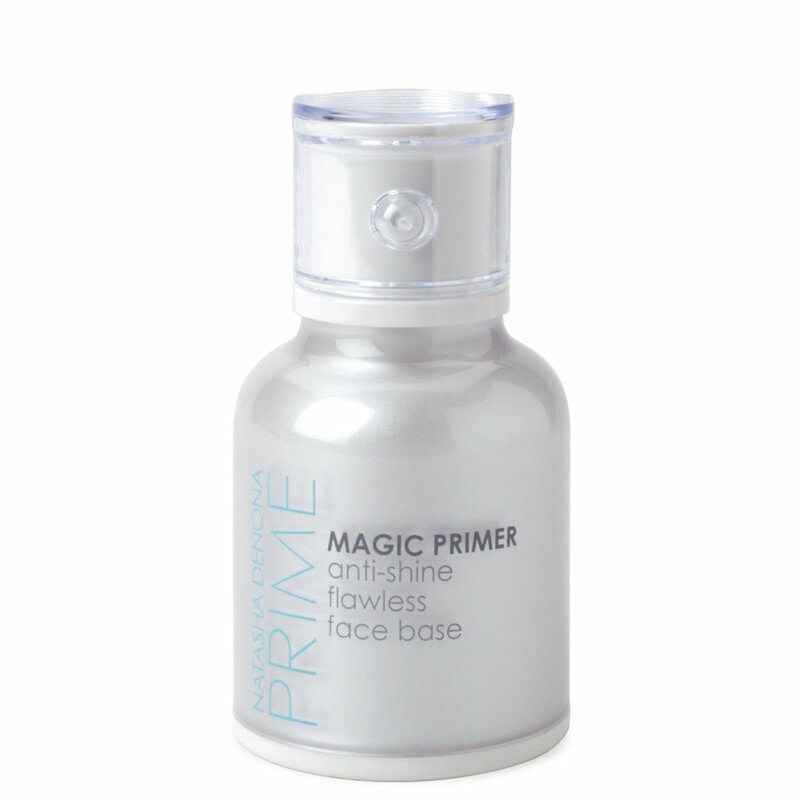 The Magic Primer Anti-Shine Flawless Face Base is the perfect skin preparation especially formulated for oily skin types. This fluid primer can be applied all over the face or to just the T-zone (for combination skin types) for a matte finish at it’s maximum. It has an immediate pore minimizing effect while providing a soft and silky feeling to the skin. Tips for Use: Smooth product over skin with fingertips and massage in until absorbed. For best results, use after moisturizer leaving skin as is or continue with foundation routine. I've been happily using this primer since it launched on Beautylish in Dec. I think it does a good job of keeping my combo skin matte and is the only way that I can wear the glow foundation. Without it the foundation stays to emollient and gets to shiny as the day wears on. Typically I only need to use the magic primer in my t-zone. I love the packaging and like that it's a new shape/ style for primer packaging thank others I have. I have noticed that a little goes a long way and 1 tiny pump is really all I need. The only reason I knocked a star off is for the price. It's 55.00 for 30 ml. As opposed to the Cover FX Mattiying primer that I also really like, which is 38.00 for 30 ml. Overall I have to give it high marks for performance and find it to be a splurge worthy purchase!!! I tried out the Magic Primer since I use ND Glow foundation. The product has a non-tacky gel-like consistency which blends and disappears into my skin, leaving it semi-matte. I like the fact that I don't feel a layer of product sitting on top of my skin, which is what I get after applying the MUFE Step 1 Equalizer primer. The Magic Primer pairs well with my ND Glow foundation and the oil control just seems better. I have less break-through shine as the day goes on + use less blotting papers to dab any hint of shine away. This is a similar product to the Kevyn Aucoin Primed Skin Developer (Normal to Oily skin types) in terms of gel-like texture, consistency and oil control. If I do use my KA SSE foundation, I get excellent oil control by first applying the Magic Primer then using a blend of the SSE foundation mixed with its Primed Skin Developer. Feel good on the skin but doesn't do a good job at controlling my oily t-zone. I get oily pretty quickly while using this primer. I don't think I will purchase it again because it's way too expensive for it's so so performance. I have looked for a way to hold my makeup longer than two seconds.....and I have (hold the presses)....found the PERFECT PERFECT product. I have Nicole Kidman skin....fair beyond the sea........which means sunscreen every time I look at the sun......at times I have felt like an oil slick....not any more. I put my sunscreen on...then this...then foundation...blah...blah.....blah.....and I am smooth as silk.....without ANY ANY shine.......all day long. I'm not kidding people when I say that this stuff keeps your makeup from not budging.......all day long. It's taken me about 3,000 years to find this wonderful product.....and,now, I will not go a day without it......... If you want your makeup to stay put and to remain as vibrant as the first moments when it's perfection......then you really need to buy this stuff!!!!!!! Finally I found the one ! !!! I have tried to highend to drugstore and finally I have found my holy grail it keeps my oils in check my pores minimal from am to pm invest in this primer you won't regret it! I have combo skin. Omg what's not to love about this primer, it's a little on the expensive but totally worth it. It leaves my skin looking and feeling smooth and semi matte. I have to reorder this. I apply this first and then another mattifying primer on top and leaves me with a perfect finish, that most of the time I don't use a setting spray or powder.